Perhaps the Next National Genealogist? That's the Texicanwife on the left [hmmm...we won't say what year this was!] And my baby sister, Eydie, on the right. 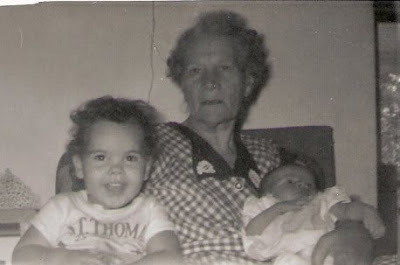 In the middle is my beautiful grandmother, Mary Elizabeth Faudree Bean [1897-1975]. This is a rare of photograph of her with the only two grandchildren she got to know. The year she died [11 months later] my parents adopted 2 little boys, so there were two more from our family. Several years later, my Uncle married and had 2 more children. Mary was the daughter of Stephen Ledford Faudree and Elizabeth Carnifax. She married John Monroe Bean, Sr.[1866-1954] in Alleghany County, Virginia. The couple lived in Monroe County, West Virginia. They had three sons: Walter Maxwell [b. 1937], Edsel Ford [b. 1939], and Roy Edwin [1943-1946]. Mary and John are buried in the New Zion Union Church Cemetery, Waiteville, Monroe County, West Virginia. Roy Edwin is buried at Carmel Cemetery, Gap Mills, Monroe County, West Virginia. 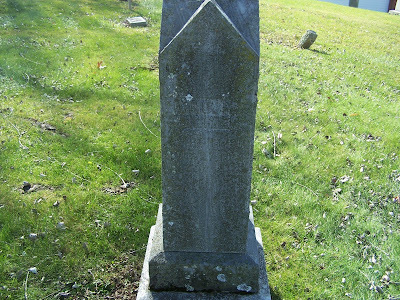 This burial is located in the Carmel Cemetery in Gap Mills, Monroe County, West Virginia. "Hey, genealogy fans - it's Saturday Night - time for more Genealogy Fun! 1) What is the most unique, strangest or funniest combination of given name and last name in your ancestry? Not in your database - in your ancestry. 3) Okay, if you don't have a really good one - how about a sibling of your direct ancestors? " Ima Bean [b.1942-d.1942] Unfortunately little Ima only lived 8 days. As far as I know, her mother is still living, so I won't list her parents here. [They are a part of my father's family]. So... what's the name that is unusual in your family's ancestry??? 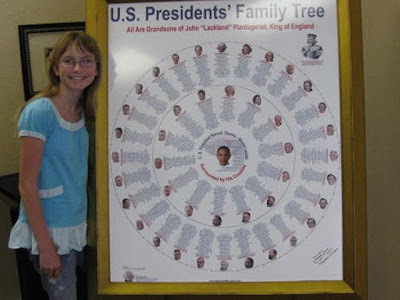 A 7th grader and her 80-year old grandfather are the first to identify that Barack Obama is related to all other United States President's except one. BridgeAnne d'Avignon, in Watsonville, California, traced Obama and all other U.S. President's, except Martin Van Buren, to John "Lackland" Plantagenet, a king of England, and a signer of the Magna Carta. The unlikely genealogy researchers spent this past summer designing the first known family tree chart that shows the president's direct relationship to one another. BridgeAnne's grandfather researched the president's genealogy for the past sixty-years. BridgeAnne hopes to personally present the chart to Obama. This has nothing to do with genealogy, but thought everyone would enjoy this! "On Saturday, October 24, from 10:00 a.m. to 3:00 p.m., the Virginia Historical Society (VHS) will display one of only twenty-six known original printed copies of the Declaration of Independence. The document—coming to Virginia thanks to the Pearson Foundation and Declare Yourself—is one of close to 200 broadsides [large posters] created from Thomas Jefferson's original draft by twenty-nine-year-old print shop owner John Dunlap. Ordered by the Continental Congress on July 4, 1776, Dunlap's printed copies of the Declaration of Independence were distributed the next day to the thirteen states, King George in England, and George Washington to be read to the soldiers of the Continental Army. Until 1989, only twenty-four Dunlap's broadsides were known to have survived. That year, a man purchased a framed painting in a Philadelphia flea market for $4. Upon examining a tear in the back of the painting, he discovered the copy of the Declaration of Independence. Take advantage of free admission to the VHS this Saturday (Members are free EVERY day) and see the only traveling copy of the Declaration of Independence - never before displayed in Virginia." If you can possibly get to LVA this Saturday, please go! This is a National Treasure!!! Back in my youth, I married a young man when I was but 16 years old. We were married for 15 tumultuous years. But throughout those years, we had five wonderful children. Grandma Jones was the 7th born child [out of 11] born to Andrew Lewis Morris and Lucinda L. Caldwell. Those 11 children were: Martha A. [b. 1879]; John H. [1879-1946] - yes they were twins! ; Walter Lee [b. 1883]; Ada F. [b. 1890]; Andrew Lewis Jr. [1892-1972]; Archibald [b.1894]; Della Mae; James E. [1899-1982]; Ernest [b. 1903]; Birdie [1893-1925]; and Lilia [b. 1906]. 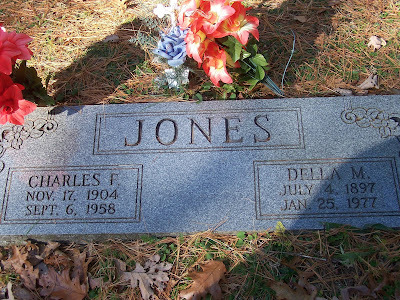 Grandma married Charles Franklin Jones, about 1930, [she never would tell me exactly when, and I have been unable to locate the couple's marriage record]. The couple had four children: Mary Lillian [1932-2002] and her twin brother, Frank [1932-1985]; Louise Virginia [b. 1936] and Lucy Velva [b.1934]. It is important to note that for two generations in a row [at least], there are twins born in this particular line. Because, Mary Lillian was my mother-in-law. Mary married Elmer Lewis Adwell [1933-1995] in 1955. They had 3 children: Andy [b. 1956]; Lillian [b. 1957] and Della [b. 1964]. And here the surge twins halted. That is, the twins halted until Andy and I were married! In November 1980, while living in Germany, we joined the family history with having twins! Yes, David and Deborah were born! So far, we seem to be the only ones from our generation that had twins of the many lines coming from the Morris family. And so far, my own children have not carried that "tradition" on. The really interesting thing, is that Grandma Jones once told me that before she gave birth to her twins, Mary and Frank, she miscarried a pregnancy that was triplets! Thankfully, that never became a family "tradition"! Andy joined the military in January of 1977. Grandma was sick when he left for Basic Training in Fort Sill, Oklahoma. Before his training could even begin, Grandma died quietly in her sleep. A wake was held in her home. Her coffin sat on a bier in the corner of the living room where her bed had stood. Mourners sat up with her body all night long before she was buried. It was a freezing cold day, and the undertakers had to dynamite open her grave for a proper burial. 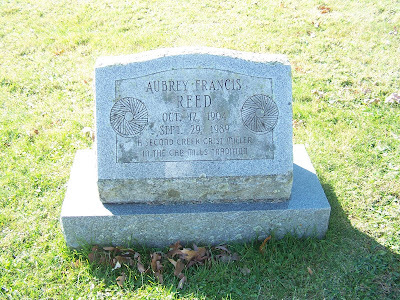 Grandma was buried beside Grandpa in a small cemetery located in the mountains in Glace, West Virginia. At the time, only dirt roads led to and from the small community. The little gated cemetery is easily overlooked, even today. Dowdy Cemetery sits just above the Hylton Church and across the road from it. They lie in similar repose to how they once lived. Quiet. Simple. While my marriage did not last to Grandma Jones' grandson, her memory lingers on. Good people. Gone....but not forgotten. I found the above on You Tube. What a treat! Enjoy! When I moved into our rental home in September 2008, I was determined to have this wall once more. I had something similar in our home once before, but it had been a few years. From this hall sits my office, where I can actually sit at my desk and see many of the portraits hanging there. 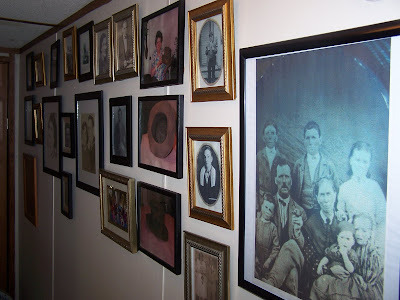 These photographs range from one of my sister-in-laws family taken in December 2008, to a rare photograph of my husband's great-great-grandparents taken about 1860. The large portrait you can see closest to the camera, is taken about 1870. It is of my grandfather and his siblings with his parents, my great-grandparents. Grandpa Bean is a very young boy in this portrait, having been born in December of 1866. It is one of only two known portraits of my great-grandparents, William and Margaret [Perkins] Bean. There is a rare portrait of my great-grandmother Josephine Benzel Dreher 1865-1932], with her mother Wilhelmina [Lambrecht] Benzel [1835-1924], along with Josephine's daughter, Florence [1885-1946] , and her first born daughter, Mildred [b.1913]. 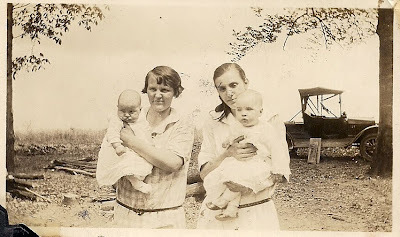 It's a lovely old 4-generation view, taken in 1913 when Mildred was a newborn baby. There is a wonderful portrait taken of my grandfather when he was studying to be a Lutheran minister. He is a very young man here, holding an open book on his knee. I treasure this portrait, as it it exactly as I remember my grandfather, with book always open and studying. He passed that love of studying on to me. I am never without at least one book being read or studied, and most often have two or three going at once! Then there is the first portrait made of my parents together, one month after they were married, taken in January 1959. They are both in military uniform. Dad was in the U.S. Navy and Mom in the WACs [Women's Army Corps]. They were both stationed in San Francisco, California when they met and married. There's a beautiful portrait of my mother-in-law, Betty [Rotge] Custer [1930-2003] taken when she was a sweet 16. She was such a beautiful girl! There's an old wanted poster of my husband's first cousin - four times removed, John Wesley Hardin. Yep, the old west gunslinger was first cousin to my husband's great-great-grandfather, Jim Clements, who is pictured on the wall twice. Unfortunately, Jim was a bad boy just like his cousin. He met an equally sad fate. There's a beautiful portrait of my paternal grandparents, John Monroe Bean, Sr. [1866-1954] and Mary [Faudree] Bean [1897-1975]. Unfortunately my grandfather died before I was born. He is probably the one ancestor I would have loved to had sat down with and discussed our genealogy. Fortunately for us, he passed most of what he knew on to my Dad, who was born in his old age [Grandpa was 71 when Dad was born]. So he was able to sit down and talk often of his ancestors with Dad. Even after picking Dad's brain over and over, there is much he doesn't know. So, I would have loved to have spoken with Grandpa about our family! And my beautiful Grandma is in that portrait [taken about 1945]. Quiet and reserved, I wish I had been more appreciative of her when I was a kid! She taught me more than most people ever realize. It was Grandma who first taught me to cook, [although Mom likes to pretend it was she who taught me!] I miss Grandma so! This wall means more to me than I can ever explain. Although I'm sure many of you researchers will understand! I feel more than just kinship with these people. There is a connection that goes beyond words. A bond that ties us together beyond blood and bones. Genetics isn't even a part of the equation. Perhaps because I know the intimate details of these lives. I live them daily as I am researching! I AM these people. They ARE me. Isn't that what genealogy is all about? I'd like to think so, at least. Betty Louise Rotge was born in 1930. 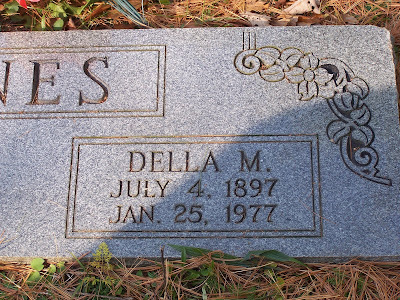 She was the daughter of John Cornelius Rotge [1910-1983] and Ora Lee Sparks [1914-1982]. She was, however, raised by her grandmother [actually believing her grandmother to be her mother for many years], Laura May Clements Sparks [1890-1969]. Betty married Joseph Wright Henry [1927-1993] in 1947. The couple had 2 sons: Johnnie [b. 14949 - my dh!] and Allan Ray [1950-2001]. The couple were divorced about 1952. Betty went on to marry Gary Raymond Hartman [1929-2002] in 1952. The couple had 2 children: JoAnn [b. 1953] and Gary Jr. [b. 1954]. They were divorced 1959. Betty later met Edwin Darl Custer [1933-1974]. "Eddie" and Betty had 3 children together: David [b. 1960], Sandy [b. 1961] and Richard [b. 1963]. Eddie and Betty weren't married until 1972 [a fact no one realized until after both of their deaths!]. Betty passed away on July 5, 2003, surrounded by her family, in her own home, in Jourdanton, Texas. She was survived by 6 of her 7 children. 24 grandchildren and step-grandchildren. And several great-grandchildren. John Crosier was born 01 March 1811 in Virginia. The son of William Crosier and Sarah Bowyer, he was only one of 12 children born to the couple. 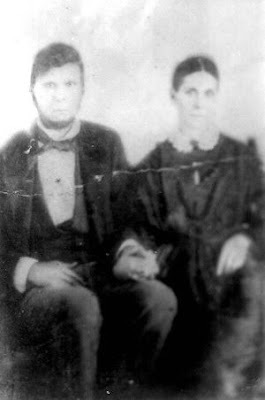 John married Nancy Chapman in Monroe County [W]Virginia about 1847. The couple went on to have at least 4 children: George William, Louis Pharr, Sarah Jane, and Mary Alice. John lived to be an amazing 101 years old. Many of his descendants like to tell the tale that he was "110" or "111" years old when he died, thus increasing his stature. However, records bear the account that John did live to an astounding 101. John is buried in New Zion Union Church Cemetery in the small community of Waiteville, West Virginia, not far from the farm where he lived most of his life. It has become apparent in my research, that county clerks were not always as accurate as what they were cracked up to be! For instance, names were often misspelled, or wrong dates placed on documents, that could affect a person's personal outcome in life. Below I will discuss just two of such cases in my own family. 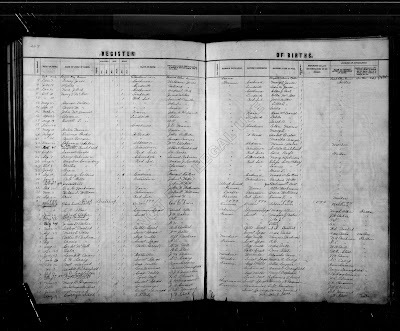 The first is the birth record for my Dad's sister, Rita [pronounced "Rye-tah"]. We all know that Rita was born on November 11, 1896. 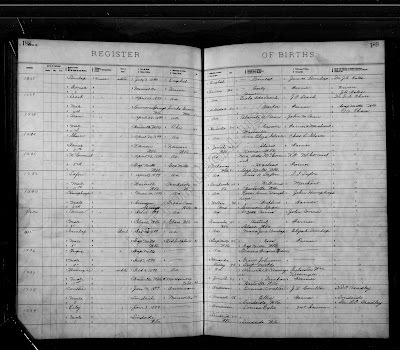 However, Rita's birth was recorded twice in the Monroe County Clerk's registry. And it would depend upon which book the current clerk looked in to confirm the name in which her name was spelled, neither of which is correct. In this first record, recorded in the 1896 birth registry, page 231, dated 11 Nov. 1896, in Waiteville, WV to J.M. Bean, farmer, and Blanche Bean was born a daughter, R. TeRee Bean. 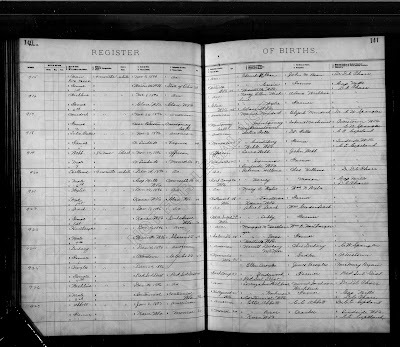 In the next, in the 1897 registry, but dated, Nov. 11, 1896, # 915, a female, born in Waiteville, WV to John M. Bean, farmer and Blanche Crosier Bean, delivered by Dr. D.C. Pharr, R.Terel Bean. Rita actually spelled her name Rita Teree Bean. The next, is a total misspelling, within the same family. Below is my uncle's birth record. 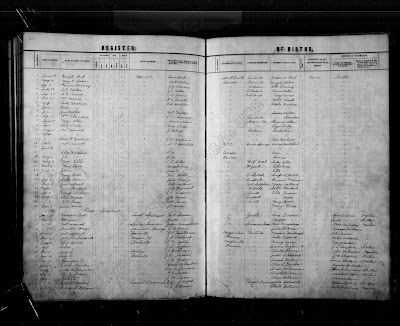 The record is found in the 1899 birth registry for Monroe Co., WV, page 247, line 12. It lists the male child's name as Lauck W. Bean, born July 13, 1899 in Waiteville, WV to J.M. Bean, merchant and Blanche Bean. The following record, however, was found for the same child listed as Bean, Male, born on 28 April 1899 in Waiteville, WV to Blanche U. Crosier Bean and John M. Bean, farmer and merchant, delivered by Dr. D.C. Pharr. The correct date, at least by his social security record, was for 28 April 1899. And his correct name was Lama Wellington Bean. My point of this exercise was to point out that individual records may have to be literally "searched" out. If I had gone looking for my Uncle Lama's birth record, just by sending in a request looking for such, I would have received notification back that no such record could be found. The same might have been done for my Aunt Rita's. When researching your family's birth records, it always pays to make a trip to the repository where those records are found to look yourself. You can search through entire years of records, and perhaps find something a clerk would overlook. Such as in the two cases above. A good researcher will be happy to tell you that all of the work cannot be performed on the Internet alone. It takes repositories of every kind to hold the records you are looking for. I don't downplay the excellence of ease the Internet has afforded us in getting our hands on many records that we might otherwise be unable to obtain, but you still won't find it all on the Internet. Get out there into those musty, dusty file rooms of local county clerks offices, and uncover your family history today! It's a trip you'll never regret! The Banner Lecture series is sponsored by the Richmond Times-Dispatch. If you miss a Banner Lecture you may listen to audio files of past Virginia Historical Society lectures at their website. Here's a little something for you from the old Mountain Genealogist. Starring my mother, my Dad, my brother-in-law Ron, my hubby, and that's really me there too!!! "Jim" was perhaps the most "well-known" of the Clements sons. Known for having ridden with John Wesley Hardin. However, Manny and Gip also rode with him. Emanuel was a farmer. His brother John passed way, leaving behind his orphaned children, and Emanuel and his wife, Martha, took those children in and raised them along with their own 11 children. Emanuel and Martha were my husband's gr-gr-gr-grandparents. George and his father [also named George] were among the very first who received land grants from the Mexicans in what is now Texas, in the Austin settlements. Annie was the second born child of six children born to the family. Of the six, only one, Thomas, was a son. Education was not a priority in the little Gonzales County community where Annie grew up. And at the tender age of 13 she was wed to James Thomas Clements, the bad boy cousin of famed western gunslinger, John Wesley Hardin. "Jim" rode frequently with "Wes", and was reputed to be as near as bad with his gun as his outlaw cousin. Until her death, in 1969, Jim's daughter, Laura May, declared the men were just "products of their time" and were not what the tabloids and books made them out to be. Annie had her first baby when she was only 16 years old, just a few months before her 17th birthday rolled around. She went on to have 11 children: Virginia [1875-1957]; Viola [1877-1965]; Crawford [1879-1880]; Emma [1881-1962]; James Jr. [1883-1956]; Ella [1886-1969]; William [1888-1928]; Laura May [1890-1969]; Lela Dee [1892-1952]; Nancy Ann [1894-1896]; Bessie Edna [1896-1925]. Annie's life was rough. She was repeatedly physically abused by Jim. And in 1897, Jim mysteriously disappeared after a particular bad beating, where Jim went nearly mad and threatened to beat his daughter and stomp an unborn child from her belly. An inquest was held after finding Jim's horse, still saddled, and blood on the saddle that was suspected to be Jim's. Although particular attention was paid to Annie and her brother, no one was indicted. Jim's body was never found. Annie went on to live a quiet life in south Texas. 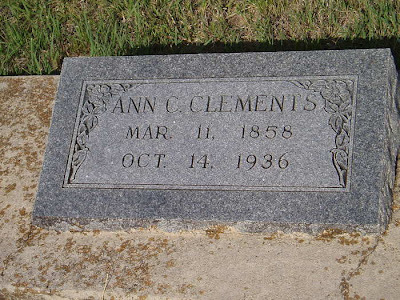 She eventually passed away in San Antonio in 1936 at nearly 78 years of age. Perhaps it is because my first husband physically abused me for 15 long years that I am able to relate to Annie so well. Or maybe just the fact that she went on to raise her children alone, as I did, that I can associate so well with this pioneer woman. I do know that many of Annie's relatives made excuses for her shortcomings, ie: lack of education, unrefined manners, etc. Annie is my husband's gr-gr-grandmother. And I do believe that if I could meet her today, Annie and I would be close friends. She exudes a quiet strength in her photographs that I feel even today. And so, today I salute Annie. And all of the pioneer women of the time. Your strength has grown into the wonderfully strong and self-assured women of this generation. What a foundation upon which we stand! Randy Seaver's given us a fun Saturday Night Challenge, and for once....I'm getting to it on Saturday night!!! 1. What is one of your most vivid childhood memories? Was it family, friends, places, events, or just plain fun? 2) Tell us about it in a comment to this post, a Comment or Note on Facebook, or in a blog post of your own." My Mom was for all intent and purposes a "single" parent, even though she was quite happily married, and I did have a Dad! You see, my Dad was a career Navy man. I grew up in Norfolk, Virginia. By the time I was 16 years old, my Dad had spent a total of 18 months of my life at home. He was always stationed aboard a ship while I was still at home. After I married, he did spend his last two years land bound. There was just my younger sister and I back then [later two brothers came along, but not until I was grown and married]. Mom would hold our hands as we searched for our own hero, our Daddy! Back then, ladies wore white gloves during an outing in the day. And hats. We were no exception. Dressed, as I said in our Sunday best, with white hats, gloves, and parasol purses, with white patent leather shoes. There were many comments when I was little about my Mama and her "little ladies", and how nice we always looked when going out. After what would seem an eternity, the men would be released to come ashore. And we'd watch the gangplank as they each and every one would descend, watching for that familiar face of Daddy. Sometimes it seemed he was the last to leave, or so we'd think in our impatience! But then, suddenly he'd be there before us. He'd sweep Mama up into his arms, and she got her hug and kiss first. Then he'd scoop us girls up and hug and kiss us. Oh, my, but our Daddy was strong! And the handsomest sailor ever! Or so we thought in our little girl minds! Proudly we'd all hold on to Daddy as we walked to our car parked just beyond the pier. When we got home, Daddy's seabag opened to treasures from ports all over the world! There were wooden Dutch shoes from Holland, crocodile leather purses from Italy, an Italian rosary, a wooden jewelry box from Amsterdam, a kimono from Japan, ivory chopsticks from China, carved native heads from Africa, a sarong from India, a tapestry from Turkey, and the list goes on and on. In a few weeks, Daddy would have to leave for another cruise. It would seem we'd just get used to having him back home, when he'd be off again. I have an infinite tender heart for service members today, and their dependents, because of my own childhood. Also because my first husband was a career Army soldier. I spent 12 years following him from base to base with our five children. My heart bleeds for the lack of respect our country affords, at times, these heroes and their families. And when one is honored, I celebrate with them! Today my Daddy is a bit heavier than he was way back then. He's in his 70's. But, that young man who walked down the gangplank to greet his young wife and daughters is still who I see when I look at him! And the pride I feel in having him as my Dad is more than I can ever express! He spent 22 years in the Navy, aboard ship as a machinist's mate. He served in the Korean War and through the Vietnam War. He was at the Bay of Pigs. My Dad. My hero. And what a wonderful memory it is to see him in his summer whites, or his winter blues. Tall. Proud. A Navy sailor! Graveyard Rabbit issued a challenge for November's carnival, and it was a bit morbid for my taste. The challenge was to write our own epitaph! November 2nd is "Plan Your Epitaph Day", an international observance created by Lance Hardie, to coincide with All Saint's Day (a.k.a. Day of the Dead). The submitted epitaph doesn't have to be in until October 25th, but this isn't one I relish, so I wanted to get it out of the way!!! So, the challenge states: "...write your own epitaph. What would you like to see on your gravestone? How would you like people to remember you? Create your epitaph, post it to your blog, and submit it to the carnival." I would like people to remember my best attributes. Bury my faults. And ressurect my love for researching our family history!